Simply fry and enjoy. Can be added to bento boxes or eaten as a side dish. 480g total (8 pieces, 60g each). 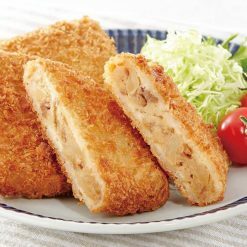 This item is simply nikujaga that has been breaded and then fried into croquettes. Nikujaga is a hearty traditional dish comprising primarily of potatoes and meat. It is sometimes associated with winter. Preparing fried foods such as croquettes can be quite messy and time-consuming, and as a result many people avoid making their own at home. However, because these croquettes arrive ready to fry, it can save you a great deal of time and nearly all of the cleanup! To fry: Without defrosting them, fry the croquettes in an ample quantity of oil (at 170℃ to 180℃) for about 5 minutes.Notes: If a large number of croquettes are fried at the same time the temperature of the oil will drop, resulting in the croquettes cooking inadequately or breaking apart. Please use caution.If there is frost on the croquettes it can cause the hot oil to jump, so please be sure to remove any outer frost before frying.Cooking times listed are approximations. Please adjust according to the quantity of oil used and the efficiency of the cookware. 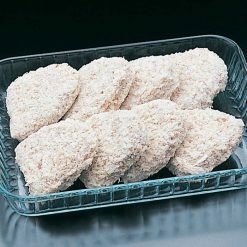 This product contains vegetables (potatoes (domestic), onions (domestic)), meat (beef (Australia), pork (domestic)), soy sauce, sugar, rice wine for cooking, beef tallow, wheat starch, yeast extract, coating (panko, wheat flour, starch syrup, potato starch, dried egg powder, soybean oil, powdered soy protein), plant lecithin (from soybeans), caramel colorants.. This product is not suitable for anyone with allergies to egg, wheat, beef, soy or pork. Origin of ingredients: potatoes/onions (domestic), beef (Australia). Prepared and packaged in Japan.